Yea!!! 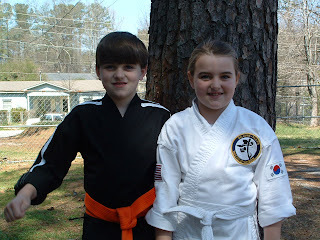 Mallory has finally joined Martial Arts class...she is doing such a great job! We cant wait until she goes up for her first belt! GO MALLORY! Can we say SUMMER JOB! Well it is almost summer and Bailey decided he wanted to 'earn' some money! Well he surely got more than he bargained for? lol He now has 3 grass cutting jobs and is doing GREAT! He is making some really good money and loving it! Which in turn makes for a wonderful opportunity to teach him about tithing and saving and giving all in one whack! We are proud of you Bailey and we know God has great things in store for you!